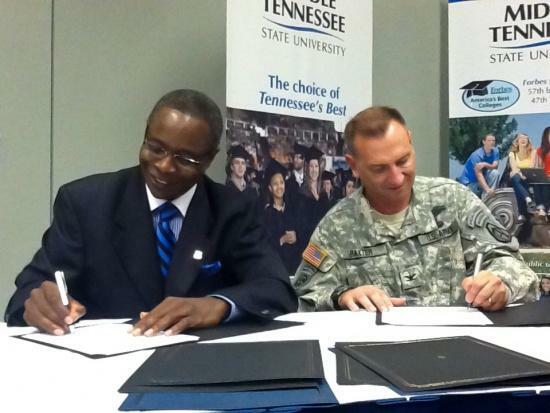 Sidney A. McPhee (left), president of Middle Tennessee State University in Murfreesboro, and Army Col. Timothy Baxter, project manager for the Army's Unmanned Aircraft Systems office, sign an agreement to share training and resources in the use of drone aircraft technology. The signing took place in Washington, D.C., at the annual gathering of the Association for Unmanned Vehicle Systems International. WASHINGTON, D.C. — Middle Tennessee State University unveiled a one-of-a-kind partnership with the U.S. Army Thursday that further solidifies its reputation as a premier spot in the nation for the study of unmanned aerial systems.